This category was the hardest to choose mainly because there are so many goodies included on variable speed pumps. Since it was so hard to mention just one, we have a few honorable mentions. The IntelliFlo VF does away with the guesswork required to calculate necessary RPMs and runtime needed for other variable speed pumps, by allowing you to input desired GPM instead of RPMs. This guarantees that you keep your pool clean and your electric bill lean. Using RPMs as the measure for throttling a pool pump is an imperfect solution when you need precise water flow and runtime schedule. Using RPMs can mean a difference of tens of gallons of GPM for a pump’s RPM on a pool with different feet of head ratings. Another neat feature of the VF is its Clean Filter alarm which alerts you when your system’s PSI has risen above your recommended level. To set up this feature, clean your filter or install a new filter media then turn on your pump. Through the VF’s filter menu, set the Clean Filter Pressure and PSI Level Rise that will trigger the “Service System Soon” alert. After the Service System Soon alert pops up, your IntelliFlo switches from monitoring GPM to managing system pressure. The VF will throttle its speed so as not to exceed the set “dirty filter” PSI value. This keeps your filter running smoothly and safely until you can clean your filter at your earliest convenience. All the variable speed pumps in our test group have an antifreeze feature that protects against pipe bursts and cracked pool equipment caused by freezing water. Antifreeze is activated when air temps dip below 40 degrees Fahrenheit. Most of the pumps give you the option to adjust the antifreeze activation temp, usually between the range of 40 – 50. The simplest variable speed to program is the PureLine Prime 1.65 HP. 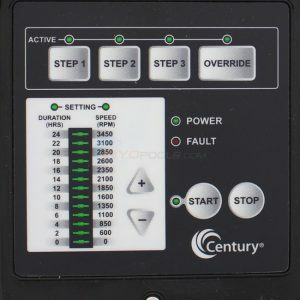 The Prime’s Century VGreen motor lacks the usual LCD display, but that slims down the programming options to three scheduled speeds, and an override option. The gadgets and features of a variable speed are nice, but they are useless if the user is unable to program them correctly. This is why it is important that a variable speed’s controller is user-friendly and the Prime’s no-frills display keeps it simple. The Prime 1.65 would be ideal for small to medium-sized pools without water features. The PureLine Prime is the best combination of performance and price among our variable speed competitors. 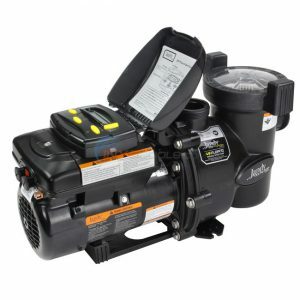 The Prime 1.65 or 2.7 HP models offer comparable water flow to the bigger brands, while its EnergyStar Rebate almost guarantees you can install a prime of equal or less than the cost for a comparable single speed pump. The Prime is powered by the leading manufacturer in pool pump motors – Century’s VGreen. 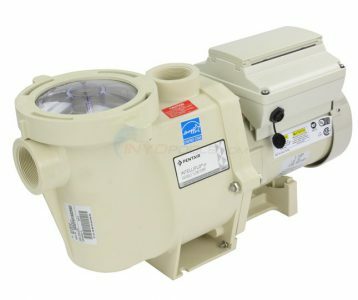 The pump’s wet end may be familiar to pool owners, as it borrows from the Hayward Super Pump’s distinct square strainer frame, a design tested and proven over decades. 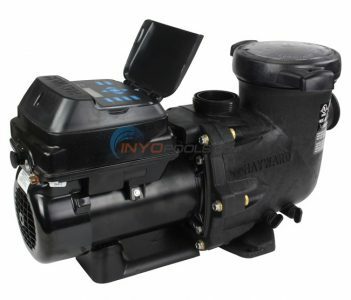 A point of note, even though PureLine is an Inyo-exclusive product, many of the replacements can be substituted for the Hayward Super Pump (meaning replacement parts can be sourced locally). The Prime’s bestselling feature may be its price. The price of the PureLine 1.65 VS is hundreds of dollars less than the comparable Hayward Super VS. The Prime also boasts a more robust, and stable mounted timer. The Prime’s EnergyStar rating makes it eligible for utility company rebates, depending on your area of the country. Meaning, you can snag a Prime VS for less than a standard single speed. The rebate incentive makes this an unbeatable deal. The cream of the variable speed crop is the Pentair IntelliFlo VF. The VF’s combination of performance, reliability, and unique flow-rate-based programming makes it a dream buy for pool equipment geeks. The IntelliFlo VF is based on the IntelliFlo VS, except the VF allows you to set desired flow rates instead of requiring the guess-and-test RPM method. This is why it won the best feature category. It is because RPMs are an imperfect way to calculate the proper flow rate for the pump. The biggest determinate of pump flow rate is a pool’s feet of head. This measurement has to take into consideration the distance from the pool, how many turns, the type of turns, and the rise in height of the water level and the pump. All that means is that 2,200 RPMs on Pool A can push 80 gallons a minute while on Pool B it may be 45 gallons per minute. Our only point of bother is the reset button for backwashing and rinsing. It is a step that can be easily forgotten, but not a source of real annoyance. The downside of creating a ranked list is that there have to be contestants that come in last. We shy away from calling these pumps losers, because they are still serviceable pumps that can do the job. Though, they just do not add up to the tough competition in this variable speed class. The full line of Jandy Variable Speed pumps, the FloPro and the ePump. Our selection was based almost entirely on Jandy’s user interface the JEP-R. The JEP timer is about as user-intuitive as an IKEA assembly manual for the Oxberg Bookcase. Our first gripe is the series of menus used for setting up runtimes, speeds, and other features like freeze protection. All of these features are spread over three different menus titled: Use, User Setup, and Service Setup. The menus have to be accessed by pressing three different combinations of menu keys, as instructed in the manual. Without the manual, a user would be lost to adjust settings. The finicky and loose buttons do not appear to be made for the long haul. If the keypad is not kept covered, I could foresee the timer being affected (a costly repair that could be remedied by a redesign). The same could have been said for the old-style Hayward controllers. Fortunately, Hayward has addressed this in their recent redesigns. I felt bad because we have a few categories, but Hayward did not place in any of them. The facts are, Hayward has a model for every need; whether it is the Super Pump VS for small pools all the way to the TriStar VS for large pools with a bunch of water features. Their performance made them the bridesmaid, but still a good pump if you can find it for the right price. As you can see, not all pumps are equal. According to our tests and opinions, the Pentair and PureLine have an edge over the competition, but do not fret if you have the Jandy or the Hayward. The latter are solid machines, but could use some improving to improve their programming and reliability. I am trying to decide on the purchase of a new pool pump to replace my 28 year old Dura* Glas Pump (made by Sta-Rite/Pentair) Mdl # P2RA5E-124L. 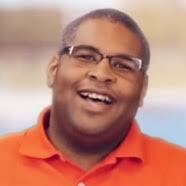 My pool is a large in-ground vinyl pool and holds approximately 33,000 gallons of water. The dimensions are 42″ X 20″. The pump location is 45 feet from the skimmer and the elevation from the pool to the pump is 6.5 feet. My current pool piping is 1.5″ in diameter. I have suction from the skimmer and a creepy hose line which are controlled by a three-way valve at the pump; the pool does not have a main drain and I have three return jets . I am not sure how many elbows are installed. My math skills are not great, therefore, can you suggest a few possible pumps from Pentair or Hayward that would best do the job? Thank you. The replacement I would lean towards is the Pureline Prime 1.65. Flowrates are similar and it is a great price for being able to switch to a variable speed. I would also consider the Pentair IntelliFlo, but it is it a 3 HP, and unless your filter is one of the larger ones and your PVC is 2″ then you couldn’t exploit to upper reaches of its RPM range. Matthew – I need some advice. I need to replace my ancient old 2hp single speed pump and I was intrigued by your article outlining the benefits of the Pentair IntelliFlo VF. My pool is 32’x16.5′ – about 23,000 gallons with about 40′ from skimmer to pump. My current pump is 2hp and the Pentair IntelliFlo VF is 3hp. My current filter is a Hayward model C5030 cartridge based filter. Would the 3hp Pentair IntelliFlo VF be too large for my pool? What is the difference between INTELLIFLO VSF and INTELLIFLOXF VSF? The Hayward C5030 Cartridge filter is a behemoth of a filter, and can easily take 150 gallons per minute of flow. The Intelliflo is powerful, but it isn’t going to overmatch the C5030. You are safe matching those two together. Hi Matthew – filter case broke (Pentair Triton II TR60) and 3/4 HP (service factor 1.27, MPRA6D-146L Sta-Rite) pump is (almost) at end of life (noisy and it shuts off due to heat related issues) – time to replace both. Suction and discharge pipe to 36000 gallon in-ground pool (approx 25-30 feet with approx 5×90 and 1×45 elbows to filter and the same back to pool – no elevation) is 1.5″. All equipment came with the house and it functioned relatively well esp after we replaced the sand three seasons back. Currently we have tall trees (leaves) around 50% of the pool circumference. Since we can configure the system fresh what do you recommend? Because you have 1.5″ piping I would go with the Pureline Prime 1.6 VS. Anything larger, then you have a top-end speed you couldn’t use because the 1.5″ couldn’t handle the flow. if you replumb all your PVC to 2″ then I suggest going with the Pentair Intelliflo or the Pureline Prime 2.7 VS.
Great article. I have an old 3/4 HP single speed pool pump that just died on me. It’s a MagneTek 8-165198-06 115V rated at 3450 RPMs. Now this is my first pool and I have only had it for a year. The MagneTek must be very old. My pool dimensions are 40ft x 20ft with an average depth of 5ft. What variable speed option would you recommend? Another 3/4 HP or should I go higher? The information provided is only motor related. Do you want a replacement variable speed motor or pump? If it is the latter, I would need to know the model number of the pump housing to get an idea of the system’s flow rates. Thanks for the great articles. I’m a huge fan of Inyopools. I’d also appreciate your advice. I’ve got a 20k gallon pool, 2 skimmers and a single drain, 2” pipe, 60sf Pentair DE filter, and no fountains, heaters, or accessories other than a Polaris 280 with boost pump. My current Pentair High Pressure challenger pump w/ AO Smith 1081 motor 1.5HP (1.6SF full-rated) worked well for many years but is getting old, and I am planning a replacement to a more efficient dual, or variable speed pump. DE filter is getting very brittle too, from Texas sun. How many HP will I need in a new pump, and might you have any specific model recommendations for my setup. Thanks again!